Fiskars Norden cast iron cookware is made of an innovative combination of premium materials that withstand very high temperatures with natural superior non-stick properties. Allows you to bring out the rich flavours in your dish. 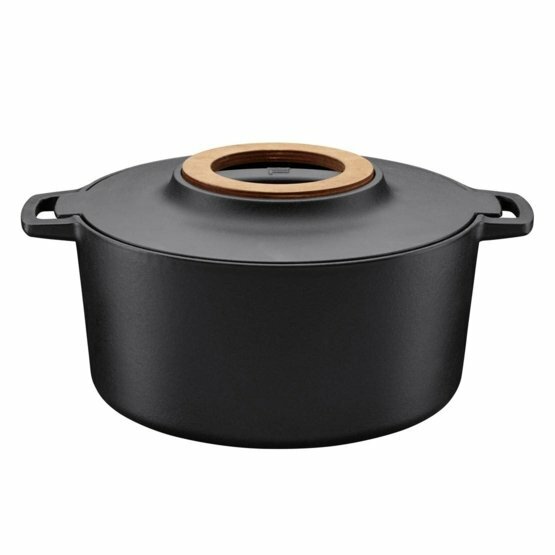 The premium quality cast iron pot is inspired by Nordic nature and traditions. Cast iron stores heat extremely well and is perfect for slow cooking. The unique Thermium™ mineral treatment on the enameled cast iron surface gives the pot superior natural non-stick properties even in very high temperatures. No rusting and no surface seasoning needed - easy to maintain. Removable wooden trivet made of Finnish birch. Made in Finland.